Dr. Montessori divided children’s development into four planes. The first plane is for children 0-6 years old. From 0-3 years a child’s absorbent mind operates unconsciously. Our pre-primary classroom provides the perfect environment for children to follow their all-important and natural urge to explore and understand the world around them. Legacy’s Pre-Primary classroom is staffed with a Montessori trained teacher with one assistant who has training in early childhood education. The materials used are designed specifically for this age group. The children are surrounded with objects that encourage language development, refinement of their motor skills, and training to increase attention span. The program is designed to meet the child’s abilities and level of maturity. This age group is ready to explore and learns quickly. Our children spend time outside every day. They have fun learning how to run and jump, and are encouraged to explore their physical world. Toilet training is part of our Pre-Primary curriculum. Children only move up to the Primary classroom after they are toilet trained. Thanks to the teachers and the group environment, and with the necessary support of their parents, they can achieve this naturally and easily. Children who have worked in the Pre-Primary classroom are prepared to move into the Primary room with little or no difficulty. Their transition is seamless. Once teachers determine a child ready, the process can begin. Each child will visit his new classroom for a couple of hours every day, over the course of a week or so, until he feels comfortable with the change. Then, a whole new world of ‘work’ opens up for him. There is so much to do. There is so much to learn. 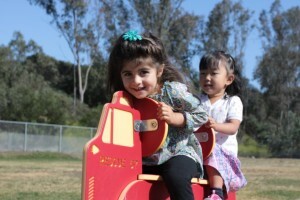 Legacy Montessori’s Pre-Primary Program is based on the Montessori principles of self-directed independent learning. Each child’s needs and abilities are unique. Our teachers follow closely as their sensitivity to language, order, movement and refinement of senses change. Montessori materials are built on sensorial exploration. Children learn by doing and by manipulating objects prepared in their environment. These materials are also designed to be self-correcting for the purpose of fostering confidence and a love of learning. As each child is different, the learning process is customized. Our curriculum facilitates the development and refinement of fine motor skills. At this age there is a direct link from hand to brain, and cognitive skills are enhanced by the work of the hands. The following areas of fine motor development have been programmed through the activities offered and the materials available within the classroom. Outdoor time is scheduled giving the children plenty of opportunity to use their large muscles and expel energy. Strength, agility, balance and coordination are practiced on a daily basis, through the use of the outdoor equipment. Language development is extremely important in the Montessori Pre-Primary classroom. The environment is filled with rich language opportunities throughout the day. Children learn to associate language to a real object, and then reinforce what they learned by the use of an abstraction. Children are also exposed to rhythmic and poetic language during story time and music circle. Children learn respect for their environment, their classmates, their teachers and themselves on an ongoing basis. Further opportunities for growth come through music time, story time, and both outdoor and indoor play times. Additionally, snacks and lunch are offered in the classroom which makes for a wonderful social time and the opportunity to enhance their social graces. Montessori education is reality based, which holds to the concept that a child must learn what is real FIRST and later can explore the abstract (make-believe). 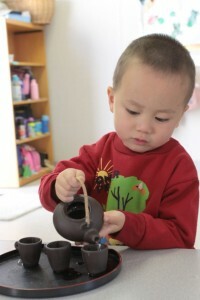 As a result, we do not have a lot of dress-up and make believe in the Montessori Pre-Primary environment. We do encourage the children to use their imaginations during music and reading, while playing games, and during self expression in the arts (drawing, coloring, crafts). In a Montessori classroom it is of the utmost importance that we adjust the program to meet the needs of the child. Therefore these are approximate times and may be altered to accommodate your child’s needs and desires.